It's been one of the main draws of High Streets - and later, shopping centres - for years, and it has a venerable history. Its origins go back to 1778, when King George III was on the throne, when it opened as a drapers' store in central London. 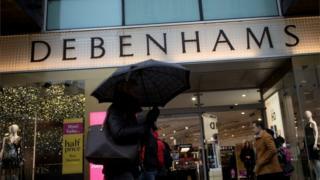 Debenhams joined the stock market, for the third time, in 2006, with a worth of £1.7bn. Its share price hit 207p one day later - a level that it has never bettered since. With hindsight, Debenhams' timing could hardly have been worse. Fashion is cyclical, but a new trend was beginning that turned out to be a game-changer. Debenhams, of course, isn't alone in failing to see the future. He says: "Put simply, the business has been outmanoeuvred by more nimble competitors, failed to embrace change and was left with a tiring proposition. The industry is evolving fast and it paid the ultimate price." On top of that, management failed to maintain the historic brand itself, says Simon Reynolds from branding consultancy Landor: "It's a case of 'another one bites the dust' as the 240-year-old business falls into the hands of its lenders. "Ultimately, Debenhams failed to establish a clear brand proposition for its customers. It couldn't demonstrate what made it different to its competitors and it lacked relevance to younger customers." At that time, it had 120 stores and planned to double the number, piling on the costs as it became increasingly out of step with shoppers' buying habits. Image caption Richard Hyman: "The fundamental fact is its lack of relevance." But the stockbroker says that came at the expense of profits: "The problem with regular discounting is it becomes a self-propagating strategy. "If customers are used to getting goods at a knock-down price, they hold off buying until there's a sale on." Veteran independent retail consultant Richard Hyman says the heart of the matter is lack of relevance: "It simply doesn't sell enough product. It's not sufficiently relevant. It isn't clear who it is targeting. That is the key issue - its relevance as a business. "If you solved the immediate property problems, you'd still be left with the fundamental fact: it doesn't have enough sales. Its sales are static." The weakening pound in the wake of the EU referendum also didn't help matters, increasing the cost of stocking the shelves with overseas goods. All that "conspired to create a beast that was unable to adapt in a fast-changing retail environment". That's up 26.9%, or £132,378, compared with the year before the revaluation came into effect. HL's Laith Khalaf says: "Debenhams is a tale of woe from start to finish."